In August, 2010, our group was part of a Ranger led six mile hike up to Iceberg Lake near the Many Glacier Lodge. It was a really beautiful hike up with a nice reward of seeing the beautiful Iceberg Lake at the end. On the way back down, the group of around thirty hikers spread out. About halfway down, everyone was bunched up on the trail with the Ranger in front. 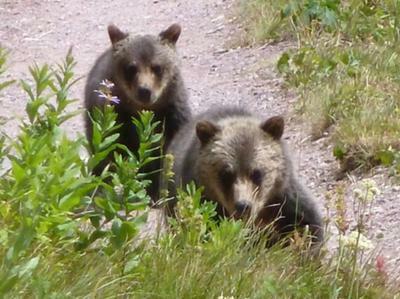 I stepped to the side and saw two grizzly cubs start running towards us about a hundred feet away. Then they saw the group and stopped. One of them stood up and looked our way. Then their mother appeared a little further down the trail with a third cub. The two cubs near us turned and ran towards her. Then all four took off down the trail. Some hikers coming the other direction had quite a start, but just got out of the way. The Ranger had instructed us that if you encounter a bear, you should try to move away from the trail and allow them to pass. It seemed like good advice. The bears were not after us, just taking the path of least resistance being the trail. Because it was a safe situation with a big group, I was able to take several good photos. At the end of the hike, everyone expressed gratitude to the Ranger for helping us through the encounter. He joked that that what he was there for, “to protect and serve”. Wow. What amazing photos you got out of that. Plus, a great story! Thankfully nobody was injured and the bears seemed more interested in passing you by than anything else. We hiked Iceberg Lake Trail in the beginning of Aug, 2010 also. We we lucky enough to see the same momma grizzly bear and her 3 cubs about 20 yards off the side of the trail. Our pics weren’t as good as yours because it was raining and the bears kept their heads now looking for food in the tall foliage. We did get to see the momma griz roll a log around looking for food. It was awesome, rain and all to see how huge they are. Simply click here to return to Do you have a Question About Glacier National Park? In 2007, we were hiking back from Grinnel Glacier in the late afternoon. Towards the bottom of the glacier trail, where it meets up with the trail along the north shore of Lake Josephine, we were warned by a ranger that there had been a grizzly bear sitting recently along the shore of the lake. We’d almost hiked passed the lake without seeing anything when we came upon two other hikers stopped on the trail ahead of us, looking intently down towards the water. We walked up to them, and they said they’d seen a young grizzly go into the water very near the trail. We decided to wait it out for a few minutes before proceeding. After about 5 minutes of nothing, we made a couple of calls of “hey bear!” (to warn it of our presence) and moved on. Where we stopped, there’s a small pond completely separated from Lake Josephine that’s about 40 yards long. As we got past it, I looked back over my shoulder and saw it – a brown grizzly in the water, looking back at us, maybe 40 yards away. It didn’t make any aggressive movement, though it did swim slowly towards us along the edge of the pond. We were all slightly nervous, but since we knew the grizzly bear was aware of us (and probably had been well before we knew it was there) and hadn’t behaved aggressively, and looked completely calm with no signs of agitation, it was probably going to leave us alone. I had my camera ready as soon as we’d heard from the two hikers there was a grizzly bear in the area, so we paused for a few seconds, and snapped several pictures. When he left the water and started walking towards the trail on a path that would take him maybe 20 feet from us, we figured it was well past time to go, and continued down the trail. 100 yards or so up the trail we met several groups of hikers heading the opposite direction (I think the boat had just unloaded some hikers). We warned them there was a grizzly bear near the trail, and to be cautious. There was one couple, a 20 something guy and girl… the girl kind of freaked out and said something to the effect of “Let’s get out of here!”. The guy seemed very excited though, and started tugging her to head down the trail towards the bear. Not sure how that got resolved. Overall, it was a great experience. The grizzly bear seemed completely calm and aware of us, and we got some nice pictures and a story too! In retrospect we were probably well within the bear’s “comfort zone” and probably should have been a little more concerned (ie, I should have had the safety off of my bear spray as soon as we knew there was a bear close by). I think it helped that we were in a group (5 people including the other two hikers when we saw it), and we’d been making noise to alert it to our presence, so we didn’t surprise it. Encountering a Grizzly Bear at Iceberg Lake: Awe, Fear, Excitement! As we rounded a corner on the trail from Iceberg Lake we saw a sow grizzly and three cubs playing in the snow. There were several others there with cameras and we were not sure if we should run or just watch. I would estimate the distance at 35 meters or so. We knew we were hiking in grizzly bear habitat and so we took all precautions. Also, the grizzlies were aware of our presence but just kept on playing, wrestling, and sliding. After a few minutes they left the snow and moved up to the trail which gave us a bit of anxiety. We made a lot of noise and they moved up above the trail and kept going up into some very steep rock cliff area. We had a great hike even before this once-in-a-lifetime experience and we could not be more thankful for such a beautiful creation only hours from home. Next time we’ll remember the bear spray! We were hiking to Grinnell lake from Many Glacier. When we reached Lake Josephine we spotted a light brownish bear (probably a Grizzly Bear) near the shore 50 yards away eating berries. The bear was next to the trail. Then a hiker approached on the trail. We waved and shouted to get his attention but he did not hear us. The Grizzly Bear hid low behind a bush 10 to 15 feet from the hiker, who did not notice the bear. After the hiker passed by, the bear calmly resumed feeding. 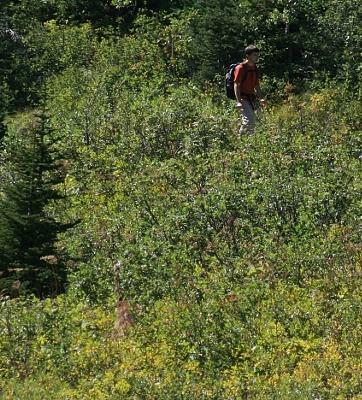 The trail was busy with hikers, and whenever hikers approached from either direction, the bear hid low behind the bush. The bear was never detected. We had to walk down the same trail to return and I told everyone to walk and talk normally but do not stop or look at the bear. We saw nothing and continued on our way. This leads me to believe that grizzly bears are all around us in Glacier National Park (after all, the entire park is grizzly bear habitat), yet we notice only a few of them. I worked on Glacier’s trail crew for many years. Had too many encounters with Ol’ Ephraim to get into here. Don’t know about this magical b.s.. Experiencing your instinctual fight or flight reaction when you can see your reflection in the pupils of their eyes is, however, quite interesting. My husband and I were just in Glacier Nat. Park for the last week July 13, 2013) and literally came within 20 feet of a grizzly on the Red Rock trail behind Many Glacier Hotel. My husband thought it was a deer since we had seen quite a few, but I was a bit behind him and saw that it was a grizzly. I backed away quickly and shouted to my husband to do the same. He did, but also got some amazing photos which we haven’t downloaded yet. So scary and hope never to have that happen again.